Keith Driver of the Prasino Group and Adam Winter of Cap-Op Energy to present new initiative today at the PTAC SME Showcase of Technologies in Calgary, Alberta. Cap-Op Energy, a leader in the field of carbon offset technology, is pleased to unveil its new Cap-Op Ready™ initiative at today’s PTAC SME Showcase of Technologies. This innovative is designed to help the market easily identify quality energy efficiency and emissions reduction products. Certified Cap-Op Ready™ products have been vetted to ensure data transfer compatibility and protocol eligibility for generating carbon offsets with the Cap-Op Energy Distributed Energy Efficiency Project Platform (DEEPP). Cap-Op’s DEEPP is designed to lower the barriers for industry to conduct energy efficiency projects, by lowering quantification costs up to 50%, and by creating predictable offset revenue. The DEEPP addresses the challenges associated with the development, aggregation, tracking, and financing of carbon reduction and fuel gas savings projects. 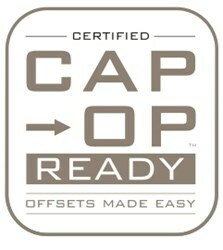 Certified Cap-Op Ready™ products have benefits for both manufacturers and producers. -Quickly letting their customers know they can count on the energy efficiency gains and greenhouse gas emission reductions from using the manufacturer’s products. -Standing behind their fuel and emissions savings claims with confidence. These claims will be backed by third party verification. -Differentiating their product while adding value for customers by providing a turnkey path to carbon offsets. -Take confidence in knowing that their energy efficiency investments can be tracked and will yield carbon offsets when products are properly installed and maintained. -Tap into available best management practices for selecting and installing these products while maximizing a producer’s return on investment. Participating manufacturers will be granted the use of the Certified Cap-Op Ready stamp for use on their marketing and sales materials, including websites and social media when related to specific products that have been approved by Cap-Op Energy. Approved products will be listed on the Cap-Op website for additional exposure. PTAC SME 2013 will highlight success stories of SMEs providing solutions to the oil and gas industry through the development and commercialization of new technologies. Operators will learn about opportunities to reduce costs, improve operational performance and reduce environmental impact. Solution providers will hear about best practices to align technology with industry needs and practices; and about support services available to them. Cap-Op Energy is a pioneer in the clean energy technology sector and is focused on making offsets easy. Co-founded by Keith Driver of The Prasino Group and Adam Winter, they have over 25 years of experience in the clean technology and Canadian GHG offset project development, regulation and implementation fields. The Petroleum Technology Alliance of Canada (PTAC) has agreed to support the DEEPP initiative through an official PTAC Collaboration project in 2012 as they recognize the potential to achieve more GHG reductions at a reduced risk by unifying accreditation efforts in a more standard and predictable way.